Italians, please forgive my one-word sentences and clichés! (If I could switch countries with you tonight, I would!) Plus: the joke was on me. Though the parcel took six weeks to arrive, it, and the perfume inside, were delivered in pristine condition. (For comparison, a parcel from a German perfume company arrived the same week in an envelope with its paper fibers barely holding together, and my name and address looked as if it had been written with a tongue dipped in ink — a miracle the U.S. Postal Service found me! Does Aromatics in White smell anything like “classic” Clinique Aromatics Elixir? Was the wait for Aromatics in White worth it? Aromatics in White does smell white: clean, milky, soapy…then powdery. When first applied, Aromatics in White whispers in aldehydic language — punctuated by sheer/clear rose, scrubbed orange blossom and patchouli (barely noticeable), and a watery, thin ambergris note mixing with a vanilla bean or two. (Aromatics in White’s ingredients seem 'bleached.') The perfume does not develop further…it just fades away in several hours. The image that came to mind as I wore Aromatics in White was a “bubble bath for baby”…using a department store, not drugstore, soap. Aromatics in White is about as inoffensive (bland) as you can get; I can’t imagine any perfumista getting excited over this one! But: this might be a perfect first perfume for a young girl. No wonder my (imagined) zesty Italian supplier decided to sell her samples and not wear them herself. 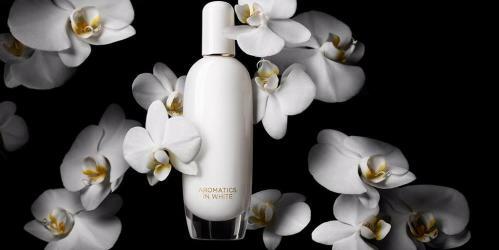 Clinique Aromatics in White is not currently available in the US (it should launch here later this year); it is available elsewhere in 30 (€49), 50 (€69) and 100 (€102) ml Eau de Parfum. Note: middle image of a baby [altered] via Wikimedia Commons. 1. Perfumer: Nicolas Beaulieu; listed notes of Sichuan pepper, violet leaf, labdanum, rose, orange blossom, patchouli, leather musk, grey amber, benzoin and vanilla. Whatta coincidence. I tried Aromatics in White on a blotter to day. I thought ‘smooth’ and ‘hum’. I put the blotter in my jacket pocket and it fell out sometime on the way home – whilst taking out the keys most likely. Schneeze: HA! Never to be smelled again…. I like your baby in bath picture! Too bad about AiW. Now you just need to wait 6 weeks for a sample of the Clinique Beyond Rose…..
Well, I certainly enjoyed that imagined scenario… probably much more than I’ll enjoy Aromatics in White whenever I eventually have the chance to smell it! Thanks, Kevin. Jessica: you’re welcome! Don’t even know when it’s due to arrive here in the U.S. I placed an actual full bottle order with First in Fragrance in Germany on 2/5 and it STILL isn’t here. It apparently sat in the DHL warehouse for 2 weeks before it even left the country (assuming it has). Last update was 2/21. I will wait 2 more weeks and then file a missing package claim with FiF if it doesn’t show up. Feh! Yes, 25 euros and it takes over a month!! Appalling. I shouldn’t be surprised. As musty as some of my friends find the original AE, I love it’s smooth, sunlit aura. I can’t imagine a lighter version, though maybe a very citrusy top note would be nice, similar to what they did to Terre d’Hermes for the Eau tres Fraiche. Maybe AE Eau d’Soliel? Coumarin: I’m “one of those people” who loved the AE Private Reserve better than the original…wish they would bring it back. I would classify Aromatics in White as a fresh rose perfume. It is gentle, but also has a certain clarity. I’v tested it twice and first think – meh – then after a while I think ‘That’s nice!’ Not ‘wow’, but certainly lovely. After a few hours it is gone. I can’t quite pin it as a chypre, and though I haven’t done a side by side with the original, I can’t think of any similarity between this, and that witch’s brew! Maybe some people don’t smell the musk as strongly? I get whiffs of something interesting in White from time to time, but mainly I get a musk similar to Bath and Body Coconut Lime Verbena. I think I’m anosmic to a lot of musks! Merlin: indeed…tastes change, but doubting something you call witch’s brew will entice! HA! It’s luck of the draw, but I got a small bottle inexpensively, quickly and impeccably packaged from an ebay seller in Germany. White is disappointing if you compare it to the original, but good if you compare it to other mainstream launches, many of which are downright unpleasant. Of course, it’s too bad they didn’t make it at least a little bit interesting; they did such a good job on the Perfumers Reserve. noz: I’m betting you can make it interesting by layering…it needs a good shot of incense…or maybe a drop of sandalwood oil on skin before applying Aromatics in White…. I like to try new releases from Clinique, but I don’t have great hopes of finding this on counter. My previous experience trying to find AE Private Reserve was fruitless. None of the Sales Associates knew what I was talking about, and I searched every counter in the SF/Bay area too! I love the original, the eau de toilette and the Sheer Velvet versions. Powdery, aldehydes and florals are ok but it’s best if I try it on skin first. SmokeyToes: I can top that…a Clinique S.A. didn’t even know what Chemistry was! Hasn’t that cologne been around since the Eighties?! HA! She called over another S.A…he didn’t know about it either. But of course I’ve never tried Chemistry before…I’ve never seen it on a Clinique counter. A Sales Associate who hasn’t heard of Chemistry? That DOES top my story! I tried this with some trepidation at my local House of Fraser store a few weeks ago. I say trepidation because the original is pokey stuff and I can’t wear it (though I like and admire it alot). However I needn’t have worried. They are kissing cousins in name only. Perfectly nice but won’t scare the horses.